It’s no secret that a major concern for women when contemplating their next mammogram is the discomfort associated with breast compression. 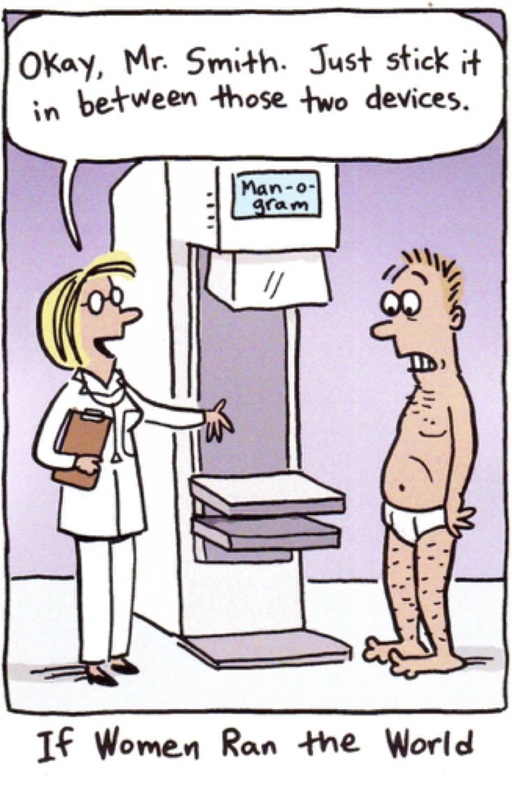 While there are distinct benefits of squashing the breast – reduced radiation dose, less X-ray scatter, better image quality, and reduced tissue overlap – there are now fortunately alternatives to the “big squeeze.” The humorous cartoon at left speaks to the fact that it is men who are responsible for the design of mammography systems. Given that CapeRay’s engineers are mostly men, we have paid careful attention to the design of the compression paddle used in our dual-modality Aceso system! Susan G Komen is a non-profit organisation that raises funds to finance research, provide medical care and support education for women with breast cancer. 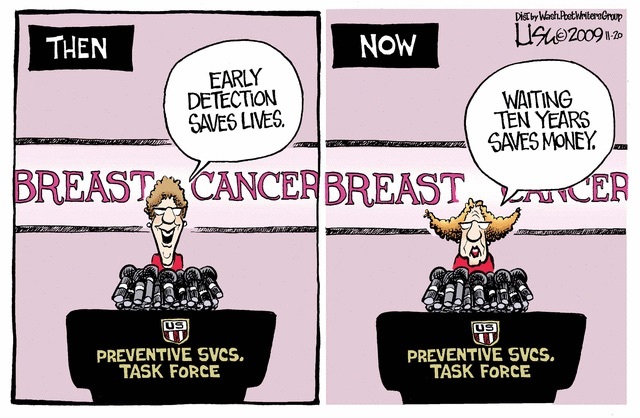 One of Komen’s fund-raising initiatives is entitled “Race for the Cure” which has been parodied by CounterThink a comic series that combines satire with an educational message. 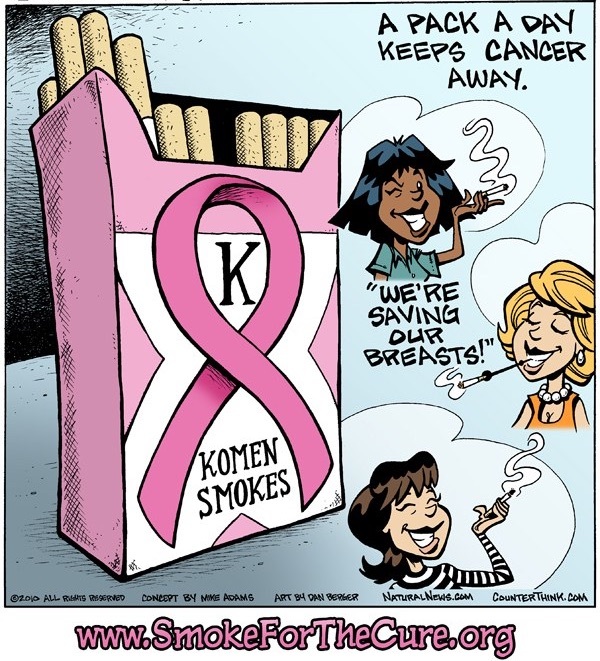 In the cartoon at right (© Mike Adams and Dan Berger), the message to women – “Smoke for the Cure” – pretends to help keep cancer away and save their breasts. As is well recognised, cigarette smoke is a known carcinogen and has been directly linked to breast cancer. 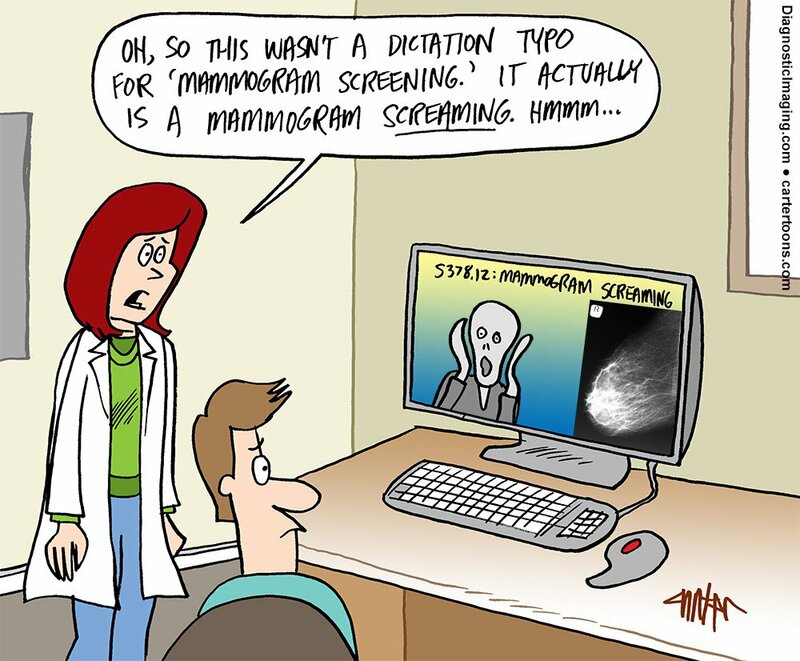 The online magazine DiagnosticImaging publishes Radiology Comics and last week featured the five most popular cartoons for 2016, including the Screaming Mammogram seen at left (© Jon Carter). Inspired by expressionist Edvard Munch’s The Scream, an iconic painting that recorded the artist’s actual experience of a scream piercing through nature while on a walk, the cartoon conjures up the frightening image of a woman who’s just been told she has breast cancer – certainly no laughing matter. As a passionate advocate for comics, Spiegelman believes the medium provides a template for how the brain processes information. Now that’s something to contemplate as we look forward to 2017! Quite recently I made contact with Dr.Judith Salerno, Ceo of Susan G. Komen. The organization had recently received $30,000,000.. THE REPLY TO ME WAS CAPERAY SHOULD APPLY FOR A GRANT NEXT SPRING . D B T-A B US, BUT GOT THE IMPRESSION THAT THE KOMEN FUNDS WERE MAINLY INTERESTED IN FINDING A CURE. THE CURE COULD BE MANY MOONS IN THE FUTURE. IN THE MEAN TIME ONE HAS TO FIND THE TUMOR EARLY, BEFORE IT CAN BE TREATED! THIS SELF EVIDENT FACT SEEM TO HAVE ELUDED DR. JUDITH SALERNO. SHE IS ON FACE BOOK. I SUGGESTED THAT THIS WAS AN EXCELLENT EXAMPLE OF A “WOMAN`S INHUMANITY TO WOMEN” NEEDLESS TO SAY I RECEIVED NO REPLY! Please, please let this important exception this important break the rule! the D3 [D B T], and a world authority on breast imaging. Professor Kopans in collaboration with Professor Kit Vaughan PhD (caperay.com) have the ability and knowledge to invent a D3/Ultrasound combination machine capable of finding up to 95% of breast cancers, but unfortunately lack funding. If you or anyone you know has lost a loved one to breast cancer, please consider forwarding my Story! Thanks Kit for all the interesting blogs. A happy new year to you and your family. As a medical dummy I have nevertheless enjoyed the blogs!